Action: Choose an opponent. 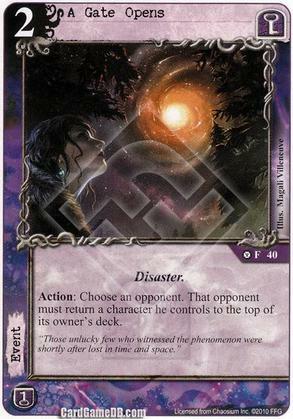 That opponent must return a character he controls to the top of its owner's deck. "Those unlucky few who witnessed the phenomenon were shortly after lost in time and space." 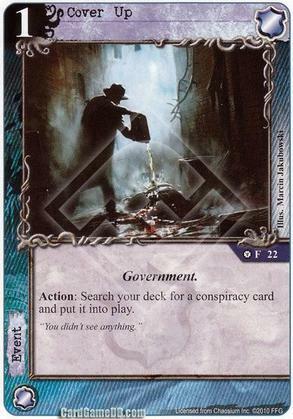 Action: Search your deck for a conspiracy card and put it into play. 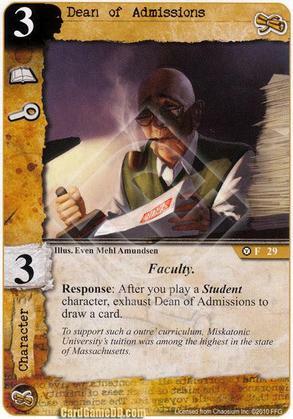 Response: After you play a Student character, exhaust Dean of Admissions to draw a card. To support such outre' curriculum, Miskatonic University's tuition was among the highest in the state of Massachusetts. 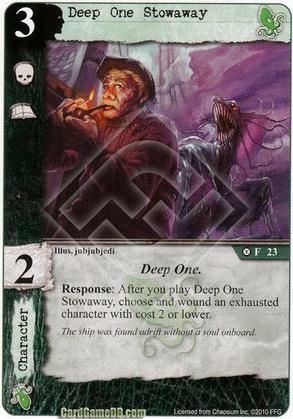 Response: After you play Deep One Stowaway, choose and wound an exhausted character with cost 2 or lower. The ship was found adrift without a soul onboard. 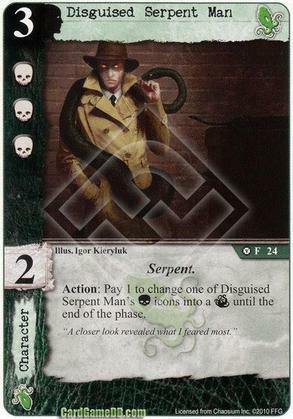 Action: Pay 1 to change on of Disguised Serpent Man's (C) icons into a (T) until the end of the phase. "A closer look revealed what I feared most." 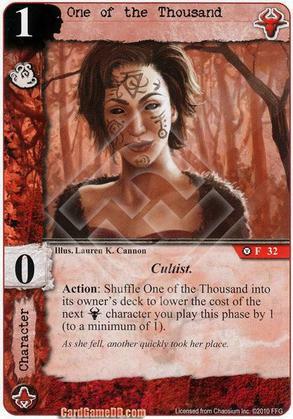 Response: After an opponent's character is wounded, draw a card. 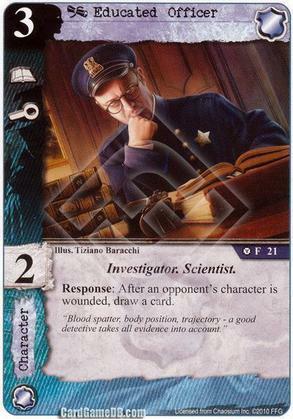 "Blood spatter, body position, trajectory - a good detective takes all evidence into account." Characters may not enter play through triggered effects. Winthrop could prove the device's effect on the magnetic field but its other applications were still considered theoretical. Play during your operations phase. 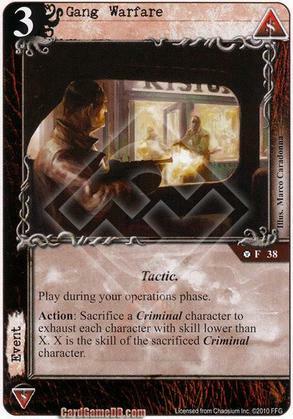 Action: Sacrifice a Criminal character to exhaust each character with skill lower than X. X is the skill of the sacrificed Criminal character. Action: Choose a character. 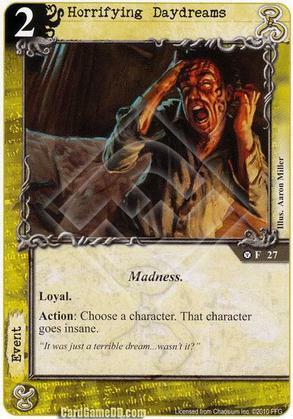 That character goes insane. "It was just a terrible dream... wasn't it?" 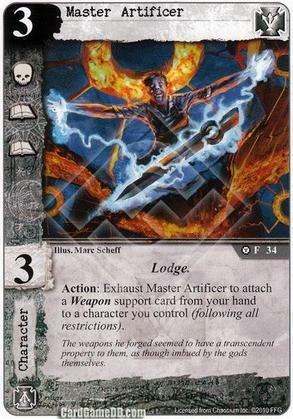 Action: Exhaust Master Artificer to attach a Weapon support card from your hand to a character you control (following all restrictions). The weapons he forged seemed to have a transcendent property to them, as though imbued by the gods themselves. 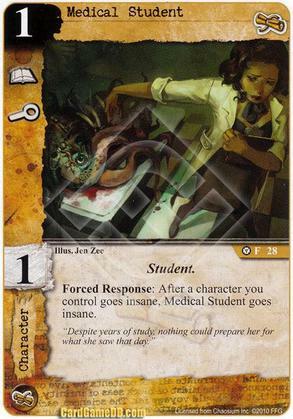 Forced Response: After a character you control goes insane, Medical Student goes insane. "Despite years of study, nothing could prepare her for what she saw that day." As she fell, another quickly took her place. Response: After Predator of the Night commits to a story, choose a character with lower skill than Predator of the Night. 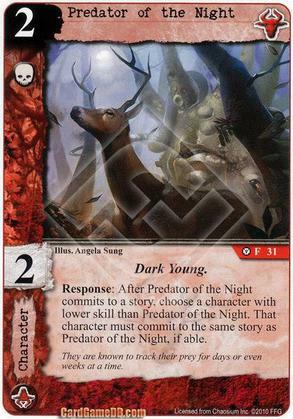 That character must commit to the same story as Predator of the Night, if able. They are known to track their prey for days or even weeks at a time. 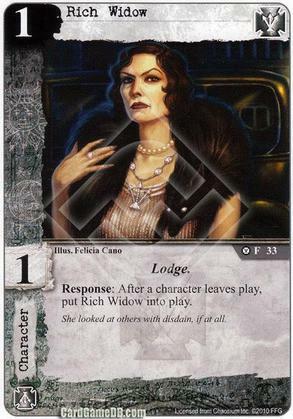 Response: After a character leaves play, put Rich Widow into play. She looked at others with disdain, if at all. 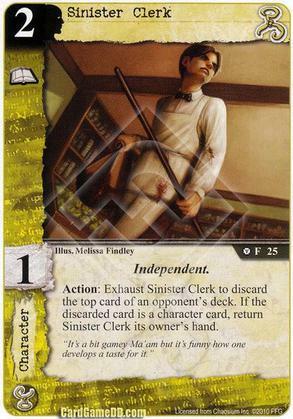 Action: Exhaust Sinister Clerk to discard the top card of an opponent's deck. 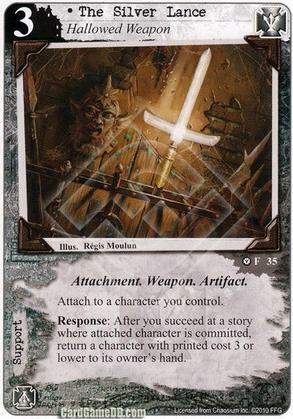 If the discarded card is a character card, return Sinister Clerk its owner's hand. "It's a bit gamey Ma'am but it's funny how one develops a taste for it." 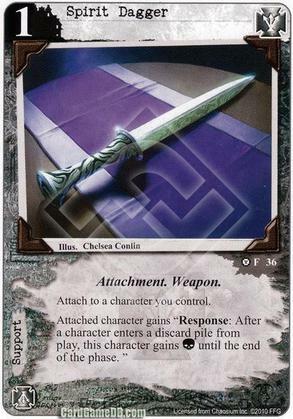 Attached character gains "Response: After a character enters a discard pile from play, this character gains (C) until the end of the phase." 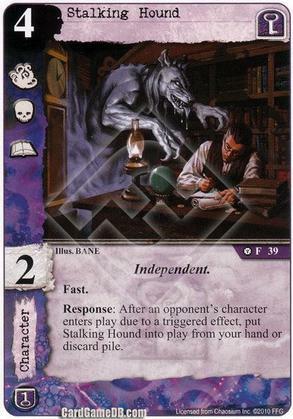 Response: After an opponent's character enters play due to a triggered effect, put Stalking Hound into play from your hand or discard pile. 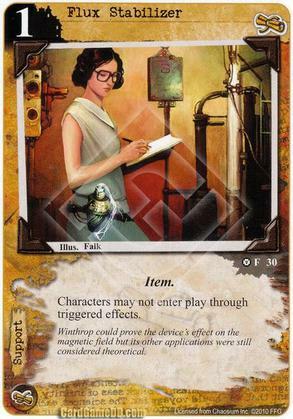 Response: After you succeed at a story where attached character is committed, return a character with printed cost 3 or lower to its owner's hand. 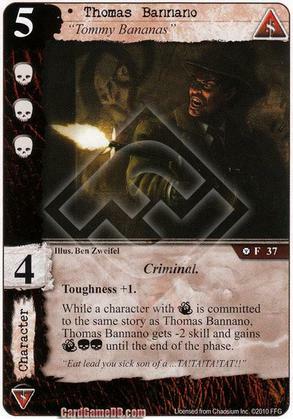 While a character with (T) is committed to the same story as Thomas Bannano, Thomas Bannano gets -2 skill and gains (T)(C)(C) until the end of the phase. "Eat lead you sick son of a... TA!TA!TA!TAT!" Twisted Choreographer gains all printed icons of characters attached to it. 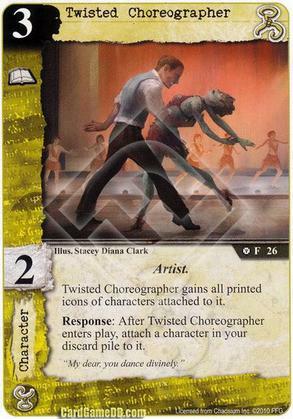 Response: After Twisted Choreographer enters play, attach a character in your discard pile to it. "My dear, you dance divinely."